Tips on Living a Healthy Lifestyle NO MATTER WHAT. 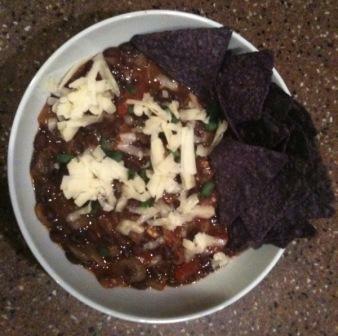 Tonight, I made a black bean soup. I used a recipe that I found on FoodNetwork.com and my husband said it was “possibly the best soup he had ever had!” The best part…it only took about 15 minutes of hands-on time and about 30 minutes total before serving. This recipe calls for bacon and, while we all know that bacon tastes AMAZING, I decided to nix it in order to keep it healthy. In order to add a bit of a smoky taste and some heat, I chopped up 2 chipotle peppers and added a tiny bit of adobo sauce – I added these in with the tomatoes, ketchup, etc. (Step 5 in “Directions” below). As far as garnishes, I used an aged cheddar that I bought at my local butcher shop, as well as chopped green onion and a few organic blue corn tortilla chips. I 86’ed the sour cream, but if you like sour cream, I recommend substituting with organic plain greek style yogurt instead. Put the bacon into a large heavy pot and place it over medium heat. Cook until it starts to give up its fat, about 4 minutes. Stir in the onions and cook, stirring, until they start to turn translucent, about 4 minutes. Stir in the garlic and cook until you can smell it, about 1 minute. Stir in the beans, turn the heat to high and bring to a boil. Adjust the heat so the soup is bubbling gently and cook 10 minutes. Season with salt and pepper. Meanwhile, pick off all the thick stems from the cilantro. Wash it and shake dry. Chop the cilantro coarsely and stir it into the soup when it has been simmering 10 minutes. Cook until the soup is thickened, about 5 minutes. Stir in the lime juice. Sounds terrific. I like the changes you made and suggestions, like using organic yogurt. I substitute that a lot! Thanks for sharing!